'CASA PAPARADISO', a waterfront property, sits high on almost 2 acres. Available year round. (NOTE: March 16-31, 2020 available with a discount if reserved for the 14 or 15 nights) The cottage is an exceptionally clean home with satillo tile floors downstairs, and solid oak floors upstairs. Twelve feet of french doors face the lake for a beautiful view, and the first floor has a 9 ft ceiling. 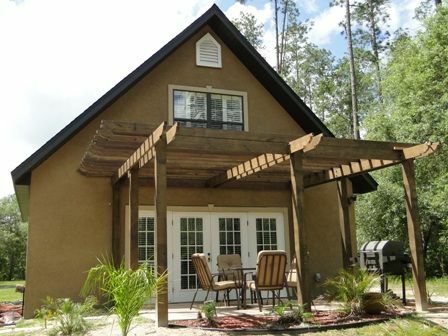 This 1040 sq ft cottage is secluded and comes fully furnished. Kitchen has stainless appliances and black marble tiled countertops and bar, with 4 bar stools. Plantation shutters cover the windows. Very comfortable plush king bed upstairs. Master bath has travertine floor, and a large walk in tiled shower with dark emperador marble. Beautiful Tiffany-style lighting over the bar and over the sink as well as a chandelier over the dining table adds to the ambiance. Open living area on first floor which includes a sofa bed, washer and dryer, and small desk. Facing lake, has a beautiful screened & covered pergola over patio with a beautiful and comfy swingbed. Flat screen HDTV DVR with satellite on first floor and TV with satellite DVR connection and DVD player in bedroom. Satellite internet for wifi throughout cottage. Vaulted ceiling in stairway with solid oak stairs. The lake is crystal clear spring fed and is good for swimming, fishing, canoeing and Kayaking. Unlike some lakes in the North Central FL area, this lake is at normal/average water level, and averages as much as 25+ ft deep. Please, no gas motors in order to preserve the lake pristine. I receive many compliments on how the cottage is 'just like home' being very well appointed with furnishings that are consistent with home and is not only clean, but smells clean. The cottage is meticulously cleaned after each guest. The cottage comes equipped with 3 kayaks, canoe, jon boat, and large 4 seater pontoon style peddle boat, and two newer bikes and several used bicycles. Lakeside near waters edge there is a 10x10 screened gazebo, and a firepit near the water, lawn chairs as well as 2 very nice cushioned lounge chairs. There is a dock that is approximately 85 ft. This lake is situated in a community of 3 lakes. The lake properties are heavily wooded and mostly secluded. There is an abundance of oak tree's, many 'dripping' with spanish moss. It is a 'golf cart community' and ideal for riding bicycles or walking/jogging. There are a number of wild animals and birds in the area, and seeing eagles fishing in the lakes is a common sight. Eagles, ospreys, hawks, swallow-tailed kite birds, and turkeys are abundant, deer, sand hill cranes, and fox are all seen in the community. Looking out the window above the kitchen sink and surrounding the front entrance, is a beautiful English butterfly garden, which also attracts hummingbirds. Thirty-five minutes from the University of Florida. Reserve early for the UF Gator football home games or graduations in Gainesville, FL . It is sure to be an exciting season! Go Gators! Or, whichever team you are a fan of! Close to Boy Scout, Girl Scout, Camp Shands, Camp Kateri, and many other summer camps near Hawthorne. Cyclists: The Gainesville/Hawthorne Bike Trail (Rails to Trails) is located a short 8 miles from the cottage in Hawthorne. Walking: The 3 lake community is great for walking or jogging. Another location for walking/hiking is the newly opened Little Orange Creek Nature Preserve. The bike trail will eventually border this wonderful preserve that has beautiful old live oaks. It will be available for various events such as weddings and family reunions. Motorcycle Enthusiasts: The Starke FL area has several biker venues that are attracting a number of bikers and events. It is located approximately 40 minutes away. Divers: The North Central Florida area has world renowned springs, which are great for diving, snorkeling and swimming. Some of them are within an hour's drive. PETS: Clean & housetrained. (The cottage has tile and hardwood floors throughout. Cottage is meticulously cleaned after each guest, and air filters changed frequently) Yard is fully fenced EXCEPT for lakeside. Fencing extends to the water and dependent on lake levels, fence may or may not be in the water. Pet fee $25. I am married, and retired from the University of Florida. I enjoy traveling, and would like to offer my guests the amenities in rental homes that I have enjoyed over the years in my travels, primarily snow skiing, and boating. I love the water and boating, and have spent my adult life on a lake close-by to the cottage. I love animals, and currently have only birds (cockatiels, sun conure, & zebra finches). I enjoy meeting and talking to people, and try to offer my guests the best possible experience at the cottage. We purchased the 1.7 acres on this beautiful lake and built the cottage. The lake is crystal clear water and one of the top pristine lakes in Florida. I enjoy the gentle breezes that blow across the property and up to the patio. It is peaceful, tranquil, and secluded with lots of wildlife and birds. A very nice place to slow down and unwind. The property is secluded and quiet. Most of my guest have commented on how quiet the area is with no traffic, which is a unique commodity not found in many parts of FL. The cottage is very well appointed, decorated and very clean. A nice place to 'get away from it all'. Swimming, kayaking and canoeing, or fishing is such a delight in the beautiful pristine water. You can see the fish swimming around the dock! Stargazing/meteor showers, full moon nights, campfires, or sitting on the dock provides great fun. The cottage sits far away from the city and its' lights... and noise. You may see one or 2 cars pass by in a days' time, if you happen to be looking! The cottage is in a heavily wooded and secluded neighborhood of 3 lakes. It is very peaceful and quiet. Blue Lake is one of the top pristine lakes in Florida, and is springfed. There is approximately 100 ft of waterfront. A new dock (Jan 2019) has been constructed, that is approximately 80 ft. Pictures will be added when fully completed. Upstairs and downstairs. Long distance not available on cottage phone. Guests may call with cell phones and have their family/friends call them back on the house phone. Plenty of open parking on this 1.75 acre lot. Well appointed kitchen with plates, glasses, silverware, cookware, pots/pans, bowls, wine glasses, small appliances, and some spices. Kitchen is fully supplied with most common items, and entertaining platters. I also keep a supply of various candles to add to the ambiance of dining at this cozy cottage. (2) Flat screen in living room, and additional TV with DVR/satellite connection and DVD player in bedroom. Butterfly & hummingbird garden.Yard is fenced on 3 sides (lake side not fenced).A small pet fee will be charged to pet owners to help defray the cost of fencing the large yard for my guests' pets. Jon boat and paddles with some life jackets, adult and children. Dock. A second patio with outdoor metal sofa with cushions, lawn chairs, and firepit, is near the waters' edge. Cottage rental includes use of a canoe, 3 kayaks, jon boat, peddle boat, water floats, and several used bikes. Please let me know ahead of time if you would like to use the bikes so they can be mechanically checked out (tires etc). However there is no guarantee on the bikes as they are rarely used. really enjoyed our stay. very relaxing and a nice lake to take out the boat or kayaks. kitchen equipped like i've seen no other. very comfy king bed. take your pick to lounge on the screened in lanai, or the screened in patio down by the water, or on the end of the dock. great sunsets! Loved this property, very quiet and clean. We will definitely be back in the summer. House and lake are lovely. House is really well but together, comfortable bed, lots of pillows, ceiling fans for circulation, TV and even some DVD to watch. Screened in porch and a separate screen room close to the lake were wonderful. Owner provides kayaks, a paddle boat and a row boat if you are so inclined. Would like to stay here again. Make sure to follow the owner's directions to the house, GPS is misleading in a lot of ways but it is relatively straightforward to find and once you find it it is easy to get back to. We thoroughly enjoyed staying here. The property is very well maintained; the home is equipped with all you need to kick back, relax, and enjoy the quiet; and Mary goes above and beyond to make you welcome! We are looking forward to a return visit!! Wildlife is abundant in this heavily wooded community. Bird watching is another exciting activity. Wild Turkeys, Sand Hill Cranes, Blue Herons, Eagles, Hawks, Ospreys, and Swallow-Tailed Kites are seen regularly around the lake. Stargazing and satellite spotting at night with the naked eye is a wonderful activity enjoyed by many, being far away from city lights. The stars are so vibrant in the night sky. (Some people have the Google Sky app on their Android/IPhone phones/tablets which identify the stars...just point it towards the sky....) Enjoy a campfire and roast marshmallows. I would like to highlight a true jewel of this part of the earth, which is, North Central Florida, known for it’s beautiful natural springs. Spring water is a natural discharge from the ‘Floridan aquifer system’, the state's primary aquifer. The water temp is 72 degrees year round, which makes swimming on a warm winter Florida day very nice, not to mention on hot days. Three of my favorite springs are Silver Glen Springs and Salt Springs in the Ocala National Forest, and Ichetucknee Springs near High Springs/Ft White area, north of Gainesville. Tubing down the Ichetucknee River is a favorite for so many. It generally takes several hours, but be sure to look at the websites to get info as the number of people that can tube down is limited (you may visit the north or south end). If visiting there on the weekend in summer months, be sure to get there VERY EARLY as they generally max out and reach capacity number of people they allow each day, in order to preserve the spring and "human footprint". There are rentals in that area for tubes etc. Visiting these State Park springs on weekdays, will be less crowded, but be sure to call for hours etc. before visiting and check pet policies. Saint Augustine has a full day of activities to offer and is located approx 1 1/4 hours from the cottage. Spend some time at the beach, The Old Fort, and the many shops and restaurants on St. George’s Street. There is a winery in the area, as well as the Alligator Farm along with ziplines and other activities. Ride the trolley around St. Augustine, or take a day trip on the many different options to get out on the water. Orlando theme parks are south of the cottage, approx 2 hours away. I keep brochures and other information at the cottage with information on many other things to do in the surrounding areas. For reservations made 45 days or less, 100% of payment is due immediately. WEEKEND RATE IS $320 (Friday-Sunday) The cleaning fee is included. Reduced rate for 2 weeks stay. Inquire. (There may be an add'l small cleaning fee added to stays over 1 week) Rates are subject to change until reservation is made. Please contact owner for availability, confirm rate, and payment details. Cleaning fee rate: Included in rental fee for 1 week or less. Two weeks add $25; 3 weeks add $50; 1 or more months add $100 Winter monthly rentals (Jan-March) can be split in 3 payments if reserved at least 8 months in advance. JANUARY, FEBRUARY, MARCH - CANCELLATION POLICY IS: 60 days or more 100% refunded, 30-59 days, 50% refunded, 29 days or less, NO REFUND. (if cottage can be re-rented for the SAME PERIOD originally reserved, a refund may be given at owner's discretion for full amount, minus a $250 fee, for each month. Cleaning fee and taxes will be refunded) PURCHASING VACATION INSURANCE IS HIGHLY RECOMMENDED. *Please inquire about monthly rates. Cottage is available year-round for rent.